Kesha has just released her latest song Here Come the Changes and here we are with ours: We have a new web player look! Give a try and don't forget to give us your feedback! Agreed. Also, I have not found a way to switch to the previous interface. Is there a way? UPD. There is a pop-up screen if you click on "queue" button located in bottom left. It shows a big album cover, together with some history. However, the screen makes "Search" bar inaccessible. I also wish there was a way to switch to the old interface. I can understand that the new one is more spaced-out and maybe more mobile-friendly, but it is harder to use quickly on a large desktop screen. KennyMinigun: As mentioned in another post on this topic, you can actually disable the new look. You can find it as a feature inside the "Deezer Labs", which you can simply deactivate. I would like a fix in the new layout. The left column is mostly empty and the cover art is lost. If I start an album or playlist and browse elsewhere, I need to see the cover art to connect me to what's playing. It doesn't have to be a mini player, if the idea is to switch us to the bottom of the main screen, but don't throw out the beautiful baby with the bathwater! I absolutely do not like the new format. I want the old format back on my account. Hi there what do you mean exactly? Can you please explain in more detail? Do you mean the new design in the browser? Hi everyone, thanks for your valuable feedback. It is not currently possible to show the cover in the new design, the only way is to go back to the old design like @Soapbubble pointed out. Sorry about that! Just trying the new design. All fine, were it not that I miss very much the album where the current track comes from! Name and picture please. In the queue the album picture is viusalised - but not the album name. I've just tried to switch to your new design and now I want to switch back to the old one! Before the change I was able to see all my playlists in a list view (only names) and now it's gone So what I need to do now is click on playlists button and scroll down ALL my 20+ playlists to find the one I am looking for. OK, guys, if you want it to be this way, please create one more view where I can see ALL my playlists also in a list view. Onу more thing - music panel. It's GIGANTIC! What was wrong with the small one on the left side? It was totally fine! Now THIS...it fits to the 1/4 part of my screen and can't be removed. OK, guys, if you want it to be this way, please let me minimize the panel to the size it ad before - the one that fit the main left bar. Hope this feedback will be helpful. As advised, I will duplicate my feedback about the new design here as well. GUYS, I'm with you! Before the change, I was able to see all my playlists in a list view (only names) and now it's gone So what I need to do now is click on playlists button and scroll down ALL my 20+ playlists to find the one I am looking for. OK, guys, if you want it to be this way, please create one more view where I can see ALL my playlists also in a list view. Onу more thing - music panel. It's GIGANTIC! What was wrong with the small one on the left side? It was totally fine! Now THIS...it fits the 1/4 part of my screen and can't be removed. OK, guys, if you want it to be this way, please let me minimize the panel to the size it was before - the one that fit the main left bar. And as a positive note, "Search" box on the top is a good idea. Thanks for all the feedback, guys! In the meantime, feel free to go back to the previous format Go to the account settings > Deezer Labs. The Search box takes up too much room at the top of the window. I like having it in the left sidebar. The player controls take up too much room at the bottom of the window. I like having it in the left sidebar. The album cover in the player is too small. I like the size in the current player. I will be using the current web player as long as I can. Fully agree with riegelstamm. The new player is not functional for the reasons as shown by him above. And not saying this just bcs I am used to the old one. Same with the Windows app, which has nearly the design of the new web player. Doesn't work for me. Hope this will not go live. Thanks! Hey guys, thanks for your feedback, we'll pass your comments on to our devs! New "Queue" window is cool and finally a big track progress bar! Please don't hesitate to share more feedback or suggestions for any improvements. We'll pass everything on to the team! How to switch back? The new design is absolutely crap! 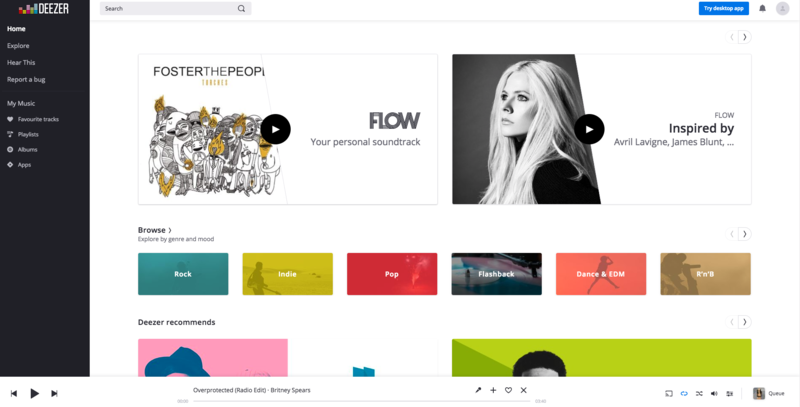 The Menu in the browser shows links to Favorite Tracks, Playlists, Albums, Podcasts and Apps. Since I usually browse by Artist, I always have to klick My Music first and then select from the horizontal bar. I'd love to be able to adjust tho links in the menu on the left to my needs. Sometimes page keeps jumping or scrolling to the top when switching to the next track in favourites with new UI. Please switch back and let me know if helps!